Today is the International Day of Charity, dedicated to eradicating poverty in all its forms and dimensions and promoting the spirit of strengthened global solidarity. As we are a business based on caring for our people, our customers and our communities, we believe that the world should be enjoyed by everyone and that we should work together to make this possible. Charity is one of Travel Counsellors’ core values which underlines just how important giving back is. It’s something special when over 2,000 people across the globe are working together to make a difference. We actively support our people in giving back and host events and initiatives that enable them to do this and we’re proud of the commitment of both of Travel Counsellors and Head Office colleagues to supporting charities. Everyone’s fantastic efforts has helped raise thousands in the last 12 months alone. Last year, we were delighted to announce that Reuben’s Retreat would be our official UK charity for 2018, with a host of events and activities planned to raise collective funding for the cause. Reuben’s Retreat has a special place in the hearts of many within the travel industry and is not only a partner to us, but part of the Travel Counsellors family. 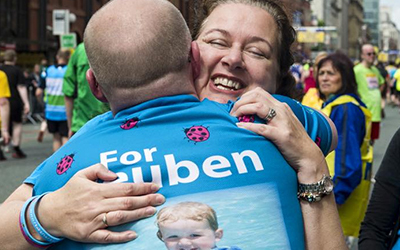 Born is memory of Reuben Michael Graham who tragically passed away aged 23 months, Reuben’s parents Mike Graham (Head of Sales Promotions) and his wife Nicola, founded the charity to help other families facing the most challenging and heart-breaking times. A chilly Spring night in April set the scene for over 40 Travel Counsellors and Head Office colleagues from across the UK to come together to conquer Wales’ largest peak for the “Snowdon Sunraise”. Scaling Snowden proved to be both physically and mentally challenging. Finding themselves at the foot of the mountain at 2 o’clock in the morning, the intrepid explorers set off with high hopes to reach the 300 feet summit in time to see the sun rise over the Snowdonia mountain range and raise as much money as possible for Reuben’s Retreat. The reward was not only an awe-inspiring view and a magical moment, but the funds raised from the event totalled more than £7,000. The charity also scaled Snowdon for a second time that weekend with more Reuben’s Retreat supporters, and the figure fundraised from the entire walking weekend hit over £32,000 – an amazing achievement that will enable the charity to create precious memories for the families they support. Inspired by the “Snowdon Sunraise” but unable to take part in the night time trek, Skegness-based Travel Counsellor and accessible travel champion Nick Markham pushed himself to the limits in an incredible challenge. With the support of a dedicated team, he achieved something truly amazing when he of conquered the peak in his wheelchair. Alongside a group of 14 walkers, Nick scaled the peak following weeks of training and upper-arm strength exercises, doing so with his team in under four hours. Nick’s team helped to carry him and his wheelchair for the final 100 metres to reach the summit, with the incredible feat raising over £1,000 for Reuben’s Retreat. Speaking after his remarkable achievement, Nick said: “All throughout the challenge I kept my mind focused on how you can achieve anything if you put your mind to it, regardless of whether you’re walking, or in a wheelchair. 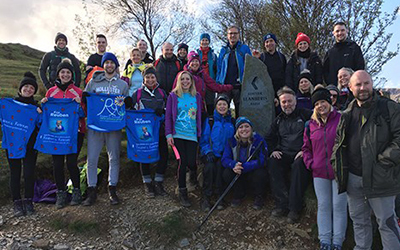 But it wasn’t the first time Travel Counsellors has mounted Snowdon this year, as over 40 TCs made the climb back in April, ascending overnight and reaching the top in time for sunrise. Their excellent efforts managed to raise an incredible total of £7,000 for Reuben’s Retreat. Charlotte Gallop from our Business Development team shared with us what it meant for her to be involved. Last year, a brave group of ten Head Office colleagues and partners, including Finance Director Simon Shaw, took part the ultimate physical challenge…Tough Mudder. 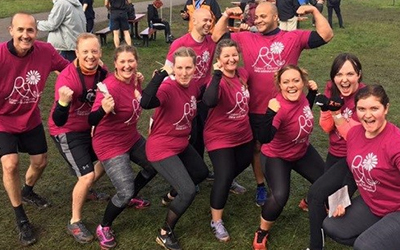 Organised by Application Support Specialist, Phillip Green, 11 colleagues and Travel Counsellors will be taking on the challenge once again next weekend including Digital Marketing Executive Steph Wilson, Graphic Designer Ryan Eccleston and Director of Digital and Innovation Waseem Haq. Travel Counsellors Global Head of Sales Promotions and daddy to Reuben, Mike Graham, has set himself the challenge to run the Salford 10K on Sunday 9th September; the day before Reuben’s 8th birthday. He will be joined by Head of Learning and Development Michael Vincent, with the aim of recruiting a sea of 100 ReuBlue runners. If each of them raises £100, Mike will reach his target of raising £10,000 for Reuben’s Retreat. Good luck to Mike and all his ReuBlue runners! Among the fundraising activities planned for the rest of the year, we’ll be hosting “My23 Reu-athon” – a 23-hour, non-stop “TCTV” broadcast from our state-of-the-art TV studio here at our Head Office in Manchester. From exploring all things Reuben’s Retreat to Carpool Karaoke, our jam-packed schedule is sure to make viewers laugh, cry, sing and dance as Head Office colleagues (including Directors! ), Travel Counsellors, Suppliers and friends of company, take part in a whole host of activities. With an ambitious target of £23,000 to raise, we’re sure this will be an unforgettable event for all involved. If you’re interested in finding out more about our work with Reuben’s Retreat and life as part of the Travel Counsellors community, you’ll have an opportunity to tune into a special segment during the show on Tuesday 9th October at 8.00pm – more details to be revealed soon! We’ve also developed initiatives to help our Head Office colleagues support charitable causes that are close to their hearts including ‘Make a difference’ days. With three days paid leave, our colleagues are able to take time out of work to participate in charity fundraising and activities. Many of our team have already utilised their charity days for a variety of different activities – from volunteering at local animal shelters to looking after elephants in Sri Lanka. Some colleagues choose to utilise their charity days a little further afield – like Recruitment Executive Cathy Oldfield, who will be heading to Nepal for a once-in-a-lifetime trip this month. She’ll be joining a Pod Volunteer project supporting underfunded and understaffed child care centre. In addition, our “Payroll Giving” scheme makes it even easier for Head Office colleagues to make pre-tax donations to their chosen charity straight from the payslip every month – helping to provide charities with regular, reliable donations that allow them to plan ahead and budget for the future. Every year at our Annual Conference, we nominate a local charity to support throughout the weekend. At our last Conference, we chose a charity very close to the hearts of many of our people – the We Love MCR charity. Together, our Conference delegates donated an incredible £6,500 which was matched by the company, as well as adding a further £2,000 donation – taking the full amount to a grand total of £15,000. The donation was divided equally between the We Love MCR Emergency Fund, founded to support the bereaved families and the people injured in the Manchester Arena attack, and the general Lord Mayor’s Charity. 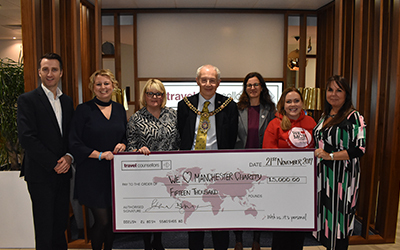 We were honoured to present the donation to the Lord Mayor of Manchester, Councillor Eddy Newman, at the firm's Manchester office, as part of an official visit. We love sending our customers to all the wonderful places the world has to offer. But we recognise that with this comes great responsibility to give back to those communities, to respect the amazing places we visit and to respect the people we meet along the way. Responsible travel is something we really care about at Travel Counsellors – that’s why we teamed up with sustainable tourism charity, the Travel Foundation, to launch a partnership that will firmly put sustainable tourism on the map for our franchisees and customers across the seven countries in which we operate. As an international charity, the Travel Foundation works to ensure tourism brings greater benefits for local people and the environment in destinations. We’ll be working together to educate our people, supplier partners and customers across the globe, around the importance of sustainable practice and the role they can play in this.